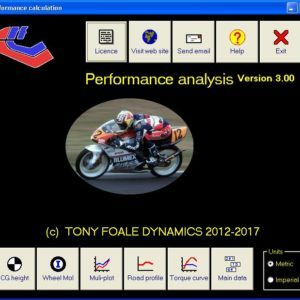 Author, racer, engineer and visionary, Tony Foale was for many years Britain’s leading practitioner of alternative motorcycle design. Before he retired to sunny Spain more than a decade ago, his humble but well equipped workshop in the Kent countryside was the birthplace of some of the most adventurous two-wheeled chassis designs ever produced anywhere, many with hub-centre steering. Bearing the Quantum name, powered by a variety of engines ranging from Kawasaki and Suzuki fours, to Ducati V-twins and the BMW Boxer-powered QL (standing for Quantum Leap!). Foale’s execution of his empirically-developed alternative motorcycle formats was both adventurous and exemplary, and a steady flow of loyal customers ensured he had the means to continue probing the frontiers of chassis technology. Foale had already produced a book back in 1983 – in conjunction with the doyen of British bike journalists, the late Vic Willoughby – entitled ‘Motorcycle Chassis Design – Theory and Practice’. This clearly written and extremely concise explanation of the black art of chassis design was a godsend to those of us back then struggling to understand the tidal wave of radical frame technology, and construction, then enveloping the motorcycle world – especially the relevance of different fork angles and trail in offering different dimensions of steering geometry. This was just two years, remember, after Antonio Cobas, the Spanish design genius who so tragically died of cancer on April 14th 2004, had invented the modern aluminium twin-spar beam frame with his 250 Kobas GP bike, and Foale and Willoughby’s book was both timely and informative. 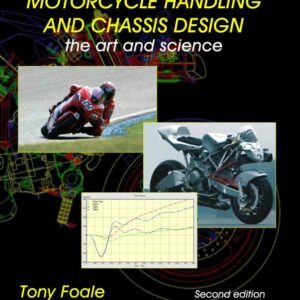 Not half as much as the much longer work which Foale himself produced in 2002, entitled ‘Motorcycle Handling and Chassis Design – The Art and Science’. This 510-page book has over five times more text and three times more illustrations and photos than the first book, and is equally easy for those of a non-technical bent to read and understand – just even more in-depth. For example, the chapter covering ‘Balance and Steering’ explains better than I have ever read before the function of the leaning-in process in steering the bike, and the importance of gyroscopic effects and steering forces in making a bike handle well – or badly! Even more fascinating is the section on Front Suspension, which contains a comprehensive and detailed analysis of all the major forms of alternative steering yet concocted by designers around the world, from ELF to Bimota, Fior/Hossack/Britten to Saxon/Motad – or the BMW Telelever ripoff of the latter design. For those who have any curioisity or interest in how and why a motorcycle handles, I can’t recommend this book highly enough – even though I admit it’s taken me a good year to work my way through it progressively, without rushing. Reading even just a couple of pages at a time will set your mind churning…..
Now, however, Foale has produced a practical follow-up tool to putting what you read in his book into practice – a Windows software package which allows the user to enter the physical dimensions of all types of modern suspension systems, and calculates the parameters of interest for kinematic analysis – namely wheel movement, spring movement, motion ratio, wheel spring rate, wheel and spring forces, structural forces and stored energy. This is both an educational tool (learn how suspension systems really work!) and a practical tool to help you get the best out of your bike, whether setting it up for track days or racing, or road riding, or enhancing ride quality and handling. The best way to see what it does is to download the user’s manual free of charge from www.tonyfoale.com/suskin/userman.pdf , and the whole package comes on a CD-ROM containing the software package, user’s manual, tutorial videos and a book on suspension kinematics in PDF format. Foale’s new book is also available in PDF form on a CD-ROM, and apparently 80% of the orders he’s received for it are for both the well-produced softback book, and the CD. 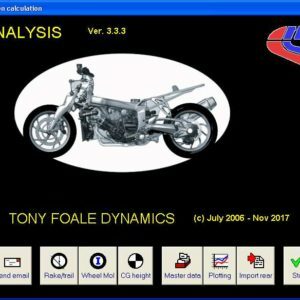 Log on to www.tonyfoale.com for details on how to order one or the other, or both – and if you’re remotely interested in chassis design, steering geometry or suspension setup, be prepared after you start reading it to wonder how you ever did without it before. I did. Some years ago, this magazine asked readers to explain “Why does a motor-cycle balance?” The replies.were few, but very varied, and proved more or less what we knew already … very few people (least of all us) could explain this mystery of our daily life. One childish scrawl suggested it was because “it knows it hurts to fall over,” which I prefer to think was a joke. But I have often observed a tendency among those with an in complete understanding of mechanical objects to endow them with mystical properties. It’s not so much that the unknowing anthropomorphise their machines, though this can happen. It’s more in the mental transposition of mechanical cause and effect from an entirely logical progression into something quite illogical, until (perhaps) low front tyre pressure can easily take the blame for a high-revs misfire; or difficulty in selecting gear is reckoned the result of the wrong width back tyre (affects chain harmonics, didn’t you know?). Truth is, a motorcycle is little more than a large and sophisticated Lego set, subject to the same physical laws; and responding in the same predictable way to any applied forces. However, there are lots of different kinds of Lego in a motorbike, and a far greater number of applied forces. So perhaps it is easy to understand how they can all get jumbled up in a persons head. All this is by way of a preamble to a new book, which (once you’ve read it) will henceforth mean you’ve got no excuse for mystification caused by ignorance. 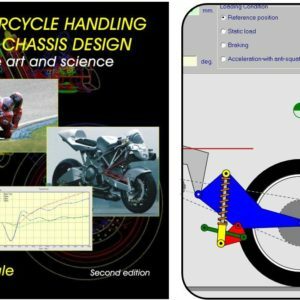 It is called “Motorcycle Chassis Design — The Theory and Practice”, and while not quite flawless as a text-book on motorcycles, performs a grand job of proving the simplicity of the basic laws governing their construction and their behaviour. Written by doyen of bike hacks Vic Willoughby, and innovative researcher/designer/builder Tony Foale, the book’s chief strength lies in keeping its readers’ feet firmly on the ground, while taking them up step by step to lofty realms of mechanics and dynamics. Thus first principles are fully and lucidly explored. For example, why does a motorcycle balance? The answer is that it doesn’t really. Rather, it stays on its wheels because it keeps over-balancing, whereupon the combined forces of gyroscopic precession on the wheels and the geometry of the steering lift it up again, Smooth progress is in fact a continuous process of deviation and correction. It goes on to explain a fascinating fact. Since the forces of steering geometry interact with the road through the tyre, the responses of a particular tyre play a big part in the equation. Now, on a wet road, a tyre has less grip than on a dry surface. It’s responses are changed, and so are the factors it feeds into the steering equation. And that is why straight-line steering feels lighter in the wet. (One need hardly add that this “feel” is a vital tool in warning us of changes in surface, and is just one of many subtle signals that we learn to use instinctive- ly without ever understanding them). In clear language, the authors deal body blows to a few sacred cows. On telescopic forks: “(Their) popularity cannot be justified on engineering grounds, because (they) are technically bad from almost every point of view. On the whimsical view that frames should be made slightly flexible: “If the chassis is not rigid enough to maintain our chosen geometry in use, then all our calculations will be set at nought.” And on the universal use of a 25-30 degree rake angle: “It is just possible that no (zero) rake angle at all would be best. Why then do all current machines have the steering axis raked … usually at the ‘magic’ 27 or 28 degrees … a) Convenience of construction; b) Lack of imagination; and c) Fear that too great a departure from tradition may inhibit sales.” This most contentious point concerning rake angle is explored in detail following a series of practical experiments in rake and offset by Tony Foale, a fascinating field of research that I hope to return to at length in the future. As well as basic principles, the book describes and ana1yses different materials and types of frame construction, suspension designs both ancient and modern, and takes you as far as you want to go into the mathematics of the matters. Illustration by photographs and simple diagrams makes it all easy to follow, and one emerges at the end with a much clearer view of the simple complexities of motorcycle steering and behaviour. Indeed, for those who wish to go further, there’s a chapter as a quick primer in practical frame building, showing you how to cope with the distortion caused by welds as they cool, and such esoteric problems. One of the book’s great strengths is that Tony Foale has made many different types of frames and suspensions … some for experiments, others to race, and still more as a way of making a living. Not only does this add authority to his text, but it gives the book a rich vein of source material both photographic and practical from which to draw. It would also have been nice to have seen a bit more about different types of brake caliper, and indeed drums. The Foale-Willoughby book, published by Osprey at £6.95, stands alone. It has no rivals nobody’s ever tackled the topic before. As a result, apart from being very good, it’s also the best in the world. ARTICLES on the steering, handling and frames of motorcycles occur rarely. But they’re in massive oversupply compared with books on the same topic, which makes any such publication a welcorne arrival. 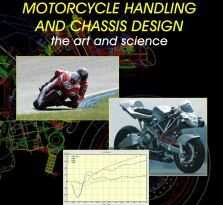 And if the book has been written by Tony Foale and Vic Willoughby, the co-authors of Motorcycle Chassis Design: The theory and practice, you can be guaranteed it will be as clear an expose of motorcycling’s “black art” as you’ll read. Tony Foale might not be as well-known in this part of the world as in Britain, where his success in building mildly radical (yet simple) frames for road racers and his ability to back up theories with working demonstiations have been well catalogued. His experience in the practical aspect of design and construction is evident in the book. Vic Willoughby is unarguably the motorcycle world’s leading technical journalist. A thirty-year career working for British magazines (during which time he rode and analysed many of the most famous road racing bikes) has been capped since retirement by several books. Two of them, Classic Motorcycles and The Racing Motorcycle, are landmarks in motorcycle publishing. Willoughby’s writing style is characterised by unfailing technical accuracy but couched entertainingly and in simple words. To achieve this trick is no easy task, especially when dealing with a subject as arcane as motorcycle handling, the elements of which are exploited in the first four chapters of the book. In dealing with the theory, the book steers a careful path betwen two extremes: on the one hand, meaningless simplicity, on the other, obscure analysis of every minor sidetrack. The second course is admittedly hard to follow under any circumstances; so little is known about the dynamics of motorcycle handling that even the most ambitious studies undertaken by the major factories are still based on rules of thumb which have been used for years, mixed with healthy measures of the “cut and try” approach which is as old as motorcycling itself. Whizz-bang graphics programs in your computer which can sketch out three-dimensional stress maps at the touch of a button cost millions and look impressive, but if they’re based on guesswork, they’re still worth zip. 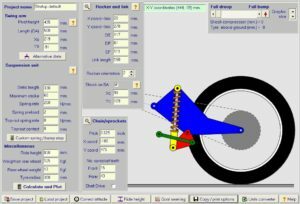 With that in mind, Motorcycle Chassis Design is as advanced as anything yet written on the subject, in that it identifies the forces and dimensions that influence a bike’s steering, and takes a fairly firm stance on their relative importance. It also argues that the “classic” figures for rake and trail can be diverged from without trouble, a contention supported by a couple of projects carried out by Foale on a BMW R75, in which rake figures down to zero (vertical forks) and trail dimensions between 50 and 100 mm were tried. Although the steeper forks gave problems under brakes, due to their inability to take the bending loads, riders reported that steering stability and lightness was better than stock under all conditions. The book is very precise in its technical terminology. Because it concentrates on getting to the heart of things without too many long-winded explanations, the sections on theory call for a careful reading of the definitions and assume that the reader has a basic knowledge of applied mechanics. The simplicity of the writing tends to mask the wealth of knowledge and rigorous application of theory behind the words. It repays several readings, as each time through yields more gems of information. The chapters on the function and history of frames, structural considerations, and the principles of suspension are not as demanding to read, but still delve deeply into such subjects as the rear-end rise experienced under accleration by shaft-drive bikes, parallelogram rear end, rising-rate suspensions, and the various families of hub-centre steered, leading link and wishbone-type front ends. A clearly-explained and well-illustrated treatment of the structural side of things helps you realise how far from ideal many apparently successful frames have been. Two chapters on engine mounting and practical frame building address themselves to subjects on which we have seen very little previous information. The first looks at the importance of the engine mounting system, and the effect it can have on vibration. While it goes little further than demonstrating how perplexing and thorny a topic this is to the would-be designer, it is nevertheless a welcome look at the subject. The more detailed treatment of practical frame building will be especially valuable to anybody with an urge to cut and weld. Again without going into masses of confusing detail, it draws on Foale’s experience to identify the points where builders often go wrong, and clearly demonstrates the correct techniques. Clear black-and-white photograhs and simple, specially-commissioned drawings back up the text of Motorcycle Chassis Design. The most complete treatment of the subject we’ve yet seen, it represents great value, even at the $21.95 (1984 version) recommended retail price, because it’s the sort of book you’ll turn to time and time again to answer any one of a thousand different queries. Review by “The Classic Motorcycle”. THERE can be few subjects as much talked about and as little understood as motor cycle frame design. The mysteries of rake, trail, castor, wheelbase, suspension rates and so on, are penetrated by very few amateurs, so we should be grateful to Vic Willoughby and Tony Foale (famous respectively as the doyen of technical motor cycle journalism and a builder of excellent frames) for compiling a most useful book entitled “Motor Cycle Chassis Design”. They cut through the nonsense and techno-babble to present a precise explanation of how and why a single track vehicle steers and handles. It is not a book which can be skimmed through; if you want to understand it you have to make an effort of concentration, but you will come out a wiser person. You will also probably come out wondering why on earth the telescopic fork has survived for so long, for Foale and Willoughby do not mince their words about this abominable device. There is an interesting section on alternative front suspensions (including girders, leading and trailing links and hub-centre devices). The book ends with a chapter on building your own frame and, given the quality of the information provided and the ability to work in metal, there is no reason why anyone reading the book should not try this. Doubtless most of the efforts produced would be a better than the standard offerings of some current bikes. There is, throughout, a wealth of explanatory diagrams and photographs, although certain chapters — notably that explaining the basic principles — could have been presented more clearly by separating the sections more definitely. However, space is at a premium and the reader can solve the problem by having a breather in between bouts of learning. As a summary of what has been achieved more or less to date in the field of traditional motor cycle frame design, the book is excellent. In a few years time (if Mr. Foale many others realise their dreams and blueprints) a revised edition may be needed. Until then, Motor Cycle Chassis Design must remain the book of the state of the art. 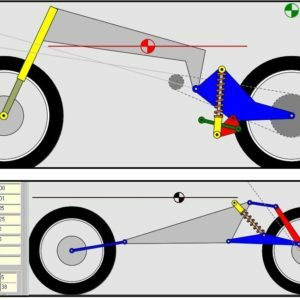 Motorcycle Chassis Design : the theory and practice. By Tony Foale and Vic Willoughby. Osprey, £6.95. If you are interested in the subject, there is no choice: you have to buy this one! Reader’s comments on new book. I’ve just received your book, and just had to stop what I was doing to spend an hour looking though it. It is a treasure! I’m just in awe of what you’ve done. I paged through and it is obvious that this is much more comprehensive than your earlier edition. ..and the more I look, the better it looks. The book is a comprehensive review and an assessment of the current state of motorcycle design and development, investigating many interesting aspects of motorcycle engineering with sound physical reasoning. I find the book excellent and that I believe that you underrate the significance of this new text you have written. Thank you also for updating an already well enjoyed book. I realize it was a great undertaking on your part. Thank you for all your hard work, this is a great book. Have been reading the new edition of the book on and off since I received it, excellent work. Goes much further than the original book but still easy to read and absorb. Have put some of it into practice already by doing things such as moving swing arm pivot and making up something similar to the A -Trak system on my T500 classic racer which has improved rear end stability markedly. …Let me say to you that your book is something rare and precious… a really great and useful piece of work! Book received, brilliant! I wish there was something like this when I was doing my motorcycle degree. I’ll be taking it into Uni later on this week to show the lecturers on the Motorcycle Engineering Degree. I am very happy to see all additions that have been made to the previous book, especially all technical/physical explanations. The CD will give me the opportunity to read the book at lunchtime at work where carrying a thick book around would be prohibitive. A quick scan through showed me how complete a work it is. I look forwards to reading it and extracting the information I am chasing. Thanks again. I have got the book and it is a great book. I actually mean what I write. ……. I do insist : you book is very good. I am delighted……… a worthwhile development in my education is about to start. Thank you for taking the pains to make your subject accessible. It already has provided me some good reading in the weekend. I hope some day to use that vast amount of information in my own chassis, if not, it has already proven it’s usefulness in analysing my daily driving. The book looks really outstanding — tremendous amount of information, and it’s really nice to have so many photos and illustrations to study! It looks great! Very impressive work………… I’m totally impressed with the way you’ve brought all these designs together in your book. Once again…outstanding work. I’m looking forward to reading it and keeping it for many years to come as a unique reference source. It looks great. Thank you for sharing your knowledege and experience with us. I deeply appreciate that you give your time to share this information and your blessings of clear thinking and a curious mindset. Thank-you. Great book! It really answers a lot of questions I have about this sort of thing. I’m very pleased with the information. From what I can tell, you have information in your book that is not available anywhere else. I don’t know how long it took you to put this book together, but the final product is outstanding. I’m impressed, you put out a quality book. I’ll spread the word. I must say, you’ve done an outstanding job! Taking a subject as complex as this, and describing it and illustrating it as well as you have is a monumental job — one you’ve done beautifully. My hat is off to you. I appreciate the excellent production of this work. I’ve been reading bits of your book (at random at this point, I’m afraid) and it’s quite inspirational. What a great work. Reading it thoroughly will take some time! Looks very interesting, just what I wanted, well done. Your presentation remains accessible as always and the extra topics are exactly what I’d hoped for. Thank you so much for writing it. A quick look through and it looks superb, thanks, great work! I have the first one you wrote in the eighties, you have out done yourself. All I can say is WOW, I never knew so much information on this topic could be brought together in one resource. Really good to read, you should see my eyes shining…. It is a great book for motorcycle enthusiasts that are interested in how and why they work. Tons of good stuff. Tony’s new book should be mandatory reading for design engineers around the world. It is a tremendously well done piece of work and well worth the price. 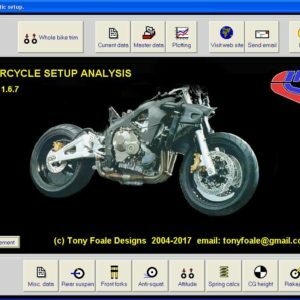 …..thank you very much for creating such a formidable masterwork regarding motorcycle chassis design and for being able to provide this work to me and ultimately to future generations. Very well done and worth the wait! The book is a wonderful resource! Thank you for a very good book and customer service. I received your book today and I was VERY impressed. You’ve obviously tried very hard to bridge the gap between what’s practical and what’s intellectual in the design and construction of motorcycles, and I think you’ve succeeded admirably. Your book is absolutely brilliant. Thank you for such a quick delivery of your book and CD that I ordered. The book is a fantastic work. I have never seen such a wealth of information about motorcycles so expertly laid out. I received the book today, many thanks. It really is good, I only wish we had something similar for race cars.